Home » Why did you get fat? Why did you get fat? 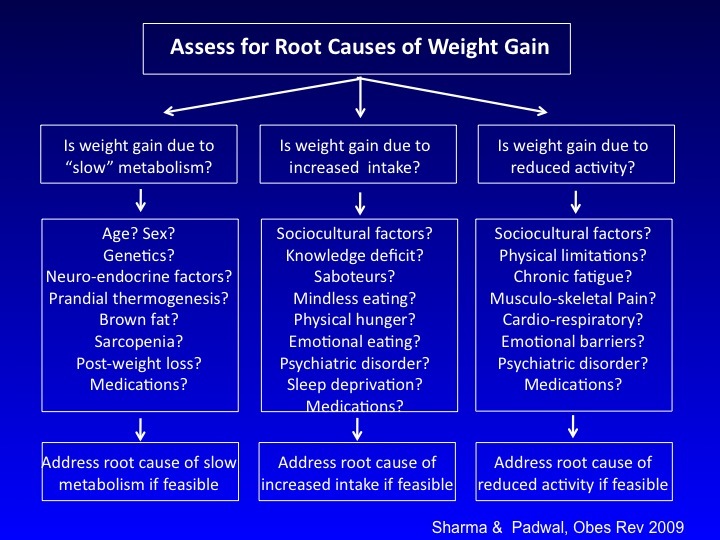 I really liked this approach of determining the underlying reasons for why we got fat. I suspect most of us will have multiple reasons and do a “1 from column A, 2 from column B” type of approach, but it helped me think through what underlying behaviors need to be be addressed for different people. Synopsized from Dr. Sharma’s Obesity blog post, Are There Merits To Subtyping Obesity? Regular readers may recall that several years ago we proposed that it was time to move beyond considering obesity a homogeneous entity (as defined by BMI alone) and suggested that clinicians may be better off using an “etiological framework” for assessing and addressing the diversity of factors that drive weight gain. This notion, that obesity is not a homogeneous condition, is something other researchers are now slowly catching up with. One example of how “mainstream” thinking is gradually embracing the concept of heterogeneity in obesity is a recent paper by Allison Field and colleagues from Harvard Medical School published in JAMA. While the the etiology of obesity applies to the many drivers of obesity (which we have categorized as predominantly affecting metabolism, ingestive behaviour and/or physical activity), the phenotype of obesity applies to the many consequences of obesity (which we have categorized as affecting physical, mental and functional health). As we have previously pointed out, the two are not necessarily related. Thus, two individuals, gaining weight for entirely different reasons (e.g. food insecurity vs. binge-eating syndrome), may well present with exactly the same amount of excess body fat and identical clinical complications (e.g. diabetes, reflux disease and urinary incontinence). On the other hand, two individuals, gaining weight for exactly the same reason (e.g. on anti-psychotic medications), may present with quite different complications (e.g. sleep apnea vs. osteoarthritis). I know this is an older post, but I just had to comment – YES! I came from a doctor appointment yesterday where I was told my weight gain was due to lack of exercise. I explained that I had suffered two serious concussions within seven months a couple of years ago, and that this may have damaged my pituitary, hypothalamus or thyroid, but she insisted it was because I didn’t exercise. I explained that I spend most of my day going back and forth between the 2nd floors of two very large buildings and I always take the stairs – probably 30 times in a day. Nope, I’m fat because I don’t “exercise”. Even when I explained that my former job had me walking up to 20 miles a day at a very fast pace and climbing over block walls, but I continued to gain weight after the concussions, it was still all about not exercising enough because that’s what it was for everyone. She reluctantly ordered hormone tests, which was the one and only useful thing she did. Amy, the more I read, the more I believe that it is so much driven by hormones such as estrogen, insulin, testosterone and cortisol, that it’s really hard to treat obesity without taking those factors into consideration. I hope she’s testing those hormones for you. On the thyroid, I was told for years my thyroid was normal. Meanwhile I was losing hair, my skin was dry, and I was tired. I had to insist that what was lab normal was not normal for me. Finally an endocrinologist helped me and was amazed that no one had prescribed it for me before. For me those mattered, key amongst them being insulin. I am highly insulin resistant and carb-sensitive. Even with a sleeve, I can’t lose weight unless I very closely control my carb intake. I currently eat less than 900 calories a day–and there are weeks on end where I don’t lose weight. I average 2 poundss a week which is fantastic–but that’s after losing most of my stomach and strictly controlling my carb intake. No such thing as a free ride even with surgery. I hope they get to the bottom of your issues and are able to help you.